Braden Coffman is an Eagle Scout and Vigil Honor Member of Wagion Lodge, Westmoreland-Fayette Council. Braden has served as trading post chairmen as well as secretary for his lodge. He has attended the 2015 and 2018 NOACs as well as the Summit debut at Prism in 2016. Braden also served as a trek guide member for the Operation Arrow Staff at the 2017 National Jamboree. He is currently studying engineering at Penn State University at the Fayette location. Braden looks forward to serving as Section Vice Chief. 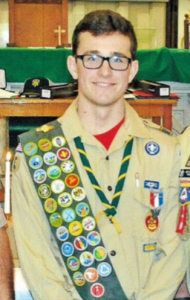 Zeb Smoyer is an Eagle Scout and Vigil Honor Member of Monaken Lodge, Juniata Valley Council. 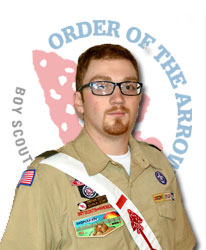 Zeb has served as the Nittany Chapter Vice Chief and Monaken Lodge 1st Vice Chief. 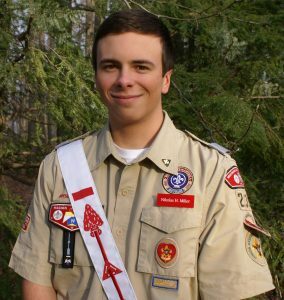 He has attended the 2015 and 2018 NOACs as well as the 2017 National Jamboree where he served as the Senior Patrol Leader for Troop 1307(Juniata Valley contingent). Zeb is currently enrolled in Bellefonte Area High School and plans to study environmental engineering at Oregon State University when he graduates. Zeb is excited to serve as Section Vice Chief. 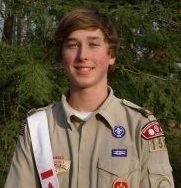 Nik Miller is an Eagle Scout and Vigil Honor member of Wagion Lodge, Westmoreland-Fayette Council. Nik served as the Lodge Secretary, Brotherhood chairman, Unit Elections/Camping Promotions chairman, and is currently the Lodge Chief. He attended NOAC in 2018 and NLS at Camp Alpine in 2017. Nik graduated from Hempfield Area High School in Greensburg, PA and currently attends Westmoreland County Community College where he hopes to earn his Welding Engineering Associates of Applied Sciences degree. Nik is looking forward to serving the order at the Section level!